Welcome to our Ischia blog, Good Morning Ischia! Here you can see the entry for Tuesday 21st January 2014. Torrential and relentless. Those would be the best two words to describe the rain that has been pelting this island from the moment I stepped off the ferry last night. Coupled with the stiff breeze it’s making for a rather gloomy scene but the outlook for tomorrow has actually improved a bit and we might be in for a nice sunny break from it all tomorrow. The maximum temperature for today is down a bit on yesterday with a high of 13° Celcius (56° fahrenheit) expected for this afternoon and the thick cloud keeping things steady with a minimum of 12°C (54°F) for this evening. Today’s photo provides a nice splash of colour to take our minds off the bleak skies and also gives me a chance to share my experience of riding a scooter on the island, having bought myself one last month. Well the first thing I should say is that you probably wouldn’t choose today for a nice pleasant cruise around the island as you’d just get very wet and a little bit upset with all the rain lashing down. 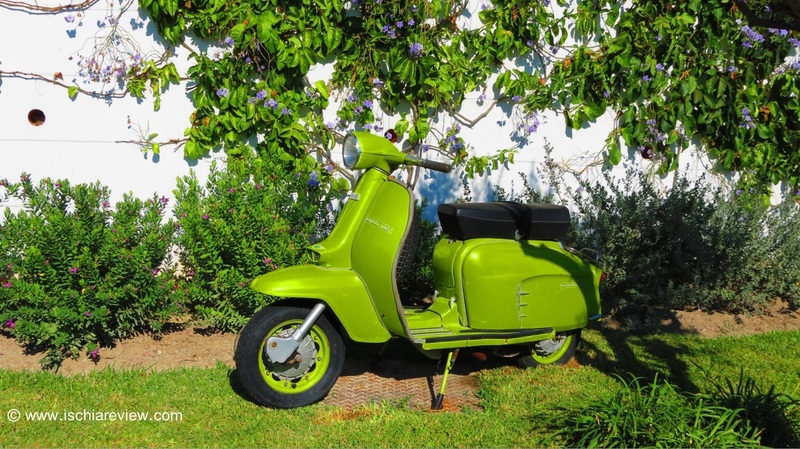 However, as most of you will visit Ischia after February when the weather is a bit more settled you should have plenty of opportunities of getting the most out of a daily scooter rental. For anyone who’s rented a car in Italy before and perhaps been put off by the thought of taking to two wheels, it’s worth bearing in mind that Ischia’s road system is quite different from what you’ll find on the mainland. The main road that circles the island is a single carriageway for the entire circumference and has very few long straights, the longest I can think of is around a couple of hundred metres or so. This is just one reason why people don’t or even can’t drive fast around Ischia’s streets and you’ll rarely find yourself exceeding 30 miles per hour (around 50 kilometres per hour). When you also factor in the amount of smaller vehicles on the road such as the ubiquitous Ape trucks (little one or two-seater agricultural vehicles with 50-100cc engines) or the converted micro-taxis, you start to understand that there’s really no need to rush and no advantage to be gained from doing so. Until a month ago I’d only ever used a scooter a couple of times and was slightly apprehensive about it but for anybody that can ride a bike and has a driving licence you should find some of the basics come as second nature. The key to it all is not to be in a rush, be sensible and take as much caution as you would if you were driving a car or riding a bicycle anywhere in the world. Once you’ve got that kind of attitude then you can really have a great time on a scooter in Ischia. I decided to buy mine as I thought it would allow me to get around more easily than if I had the car and there’s also the added bonus of lower fuel and parking costs. The best thing in my opinion is that when you turn a corner and see a magnificent view in front of you, something that will happen a lot in Ischia, then instead of having to worry about where you’re going to park the car you can easily find a place to park your scooter if you want to stop and take some photos for example. When the sun is out and you’re riding through the mountain areas of Serrara Fontana or if you take the winding road down to Maronti beach and see the bright blue speckled water down below there’s really no better feeling. The sense of independence and freedom to roam from one beauty spot to another makes for a lot of fun and invigorates the brain and the lungs as you enjoy the fresh air that engulfs you. Of course there are times when a car is more practical, such as when you have passengers, children or luggage to carry but if you do get the chance to take a scooter out for a day or two then it’s an opportunity not to be missed. Much as I don’t want this to sound like a shameless plug for our services (honestly! ), you can of course rent a scooter through ourselves. We’ll provide you with a helmet and also talk you through some of the do’s and don’ts while you’re on the road as well as recommend some of the best places to visit but you’ll have plenty of time for exploring the island in your own way. If you’re interested in prices and further details then simply drop us a line or visit our auto-rentals page to have your questions answered. Ok that’s all from me today, having said all those great things about scooters I’ll probably be hopping on a bus later of the rain persists but fingers crossed it clears up a bit later. Have a great day wherever you are and try to keep dry!